Strengthening Ford’s performance reach for 2020 and just in time for the pony car’s 55th anniversary, the new 2.3L High Performance Package for the entry-level Mustang EcoBoost®creates the most powerful four-cylinder sports car offered by an American automaker. This is the result of a unique EcoBoost engine powered by Ford Performance and upgraded handling components from the Mustang GT Performance Package. Reminiscent of development of the original Mustang in 1964, the car began as a five-person skunkworks project in the Ford Performance garage. Following an experiment with a Focus RS engine swap, the Mustang team leveraged Ford’s quickening product development times to accelerate and complete the design-to-approval process for the 2.3L High Performance Package in under 10 months. Available on the entry-level Mustang EcoBoost fastback coupe or convertible models this fall, the Mustang EcoBoost package was developed to feel at home both on thrilling mountain and coastal roads and even on the most precise autocross courses thanks to its Mustang GT brakes, performance tires, and chassis and aerodynamics hardware from the Mustang GT Performance Package. To make their project a reality, members of the Mustang team traveled to Valencia, Spain, home of the Ford Performance-tuned 2.3-liter engine, to convince plant management to build a new variant of the turbocharged four-cylinder specifically for Mustang. Then, with the Ford Performance-designed engine as a starting point, they tuned the EcoBoost to more broadly and responsively deliver a projected 330 horsepower and 350 lb.-ft. of torque achieved with premium fuel (per the SAE J1349 standard). Having secured production of the die-cast alloy block and high-performance cylinder head, the engineering team specified a 5 percent larger 63-millimeter twin-scroll turbo compressor and a larger radiator, then calibrated the engine to run both Ford’s 10-speed SelectShift® automatic and 6-speed Getrag manual transmission. The 2020 Mustang 2.3L High Performance Package is designed to run 0-60 in the mid-four-second range on premium fuel, with top speed increasing to 155 mph, a 10 mph gain over the 2019 EcoBoost Performance Package and 34 mph faster than the base EcoBoost Mustang. Helping to deliver 143 horsepower per liter, the new 2.3L High Performance Package includes a fully active quad-tip exhaust system with a signature tuned sound. The new 2020 2.3L High Performance Package feels sharp and nimble, with an aggressive road-holding stance, near-balanced 53/47 weight distribution and fully independent suspension, plus chassis and aerodynamic upgrades from the Mustang GT and its Performance Package. For greater steering precision, the team added an alloy strut tower brace to stiffen the chassis at the front. To improve stopping power and fade resistance, the 2.3L High Performance Package adds larger four-piston fixed calipers with 13.9-inch front rotors from Mustang GT. It features a 32-millimeter sway bar up front and a tubular 21.7-millimeter bar at the rear. New performance calibration tuning is applied to the electronic-controlled power steering, antilock braking, stability control and five driver-selectable drive modes. For improved cornering, a 3.55:1 limited-slip rear axle is included, plus package-specific 19x9-inch machined-face aluminum wheels and 255/40R summer tires. For an aggressive look, the new EcoBoost 2.3L High Performance Package includes a large black front splitter and belly pan, plus brake cooling ramps from the Mustang GT Performance Package – add-ons that also work to reduce front-end lift and improve brake cooling. A blacked-out grille with offset Mustang tri-bar pony emblem, 2.3L High Performance Package side badges and magnetic gray side mirrors and raised blade rear spoiler add to the performance look, while a unique metallic gray stripe crosses the hood. An engine-spun aluminum instrument panel with oil pressure and turbo boost gauges, plus a serialized dash plaque highlight the interior. Increasing lateral acceleration grip and stopping power, the available EcoBoost Handling Package includes semi-metallic brakes, specially calibrated MagneRide® dampers and a TORSEN® 3.55:1 limited-slip rear axle. Wider 19x9.5-inch premium painted aluminum wheels with 265/40R Pirelli P Zero™ Corsa4 summer tires provide traction, while a 24-millimeter solid rear sway bar, up from 21.7 millimeters, improves handling balance. 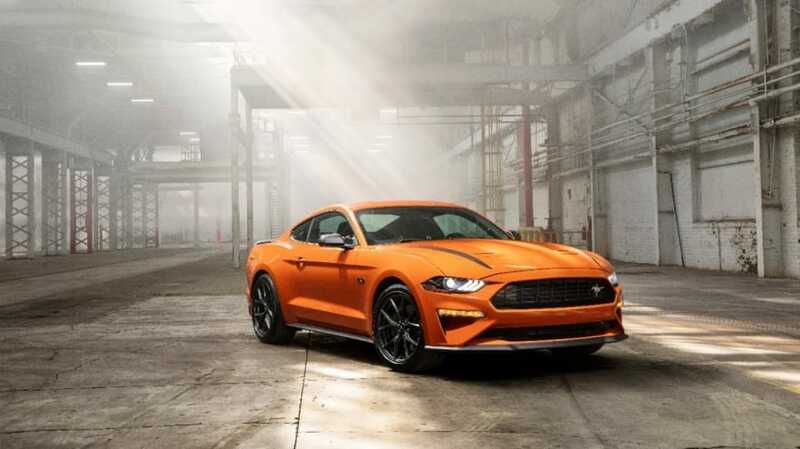 The new EcoBoost Handling Package is available exclusively on the 2020 Mustang EcoBoost fastback coupe with the 2.3L High Performance Package with either 6-speed manual or 10-speed automatic transmission. FordPass Connect™, now standard on Mustang for 2020, allows owners to interact with their vehicles via a smartphone. Using FordPass Connect’s phone application, owners can locate their parked car, lock and unlock it, and check vehicle status, such as fuel, oil levels and maintenance alerts. For automatic transmission-equipped Mustang models, the system has a remote start feature. The availability of these features varies by market. Available SYNC® 3 with AppLink™ adds enhanced voice recognition communications, 911 Assist and two smart-charging USB ports. Four new Mustang colors for 2020 include Grabber Lime, Iconic Silver, Red Hot Metallic Tinted Clearcoat and Twister Orange. New 17-inch sparkle silver-painted aluminum wheels now come standard on the base 2020 Mustang EcoBoost. The 2020 Ford Mustang with 2.3L High Performance Package arrives at dealerships this fall. Performance milestones of 0-60 mph, top speed, and horsepower and torque ratings are based on using fuel as per SAE J1349 standard; actual performance may vary. FordPass Connect is required for certain remote features. Service includes a one-year trial for remote features, excluding Wi-Fi hotspot, that starts with the vehicle sale date (after which fees apply). Connected service and related feature functionality is subject to compatible AT&T network availability. Evolving technology/cellular networks may affect functionality and availability, or continued provision of some features, prohibiting them from functioning. Certain restrictions, third-party terms or message/data rates may apply. Ford Motor Company is a global company based in Dearborn, Michigan. The company designs, manufactures, markets and services a full line of Ford cars, trucks, SUVs, electrified vehicles and Lincoln luxury vehicles, provides financial services through Ford Motor Credit Company and is pursuing leadership positions in electrification, autonomous vehicles and mobility solutions. Ford employs approximately 199,000 people worldwide. For more information regarding Ford, its products and Ford Motor Credit Company, please visit www.corporate.ford.com.